In the non-racing world, Dyer's Top Rods may not be considered a flashy company. But in the racing world, the hardware collected in feature wins and championships by teams with engines held together by Dyer's connecting rods make for a ton of flash. And that's all that really matters to Roger Friedman, owner of Dyer's Top Rods. He knows this from his life experience as a successful race engine builder and a team owner in circle track racing. He's proud to say that Dyer's Top Rods, Forest, Illinois, is a family-run business in a small town (population 1100). He's proud to say that there's no computer answering the phone. And he's proud to say that a connecting rod from Dyer's new NL line for LS applications and more is in an engine generating 2500 horsepower. 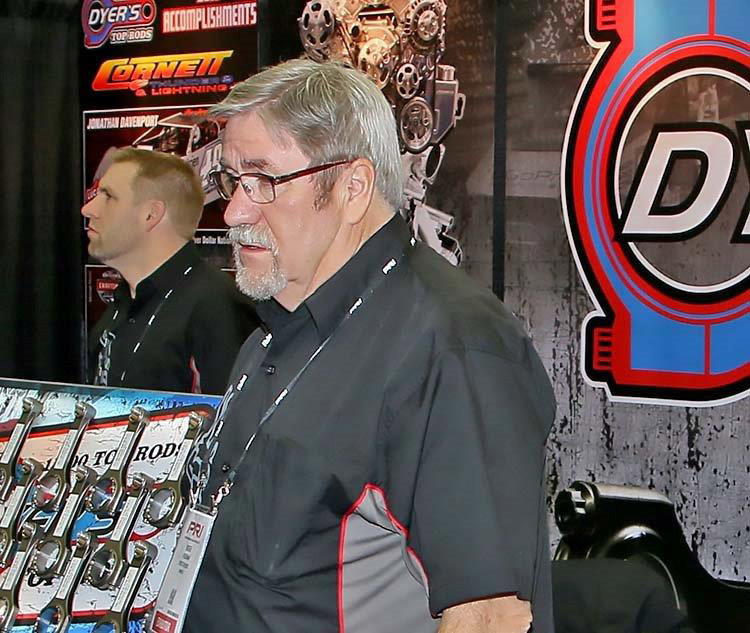 For the past 18 years, since Friedman purchased the company from Gary Dyer, making better connecting rods for winning race engines is the sole daily focus of Dyer's Top Rods, one of the steadiest, most solid suppliers of race engine parts in the country. Enjoy this "5 Questions" EPARTRADE interview with one of the most respected figures in the racing industry, especially in the circle track segment. Really, how I got started in racing is when I was six months old at our local race track—I was in the stands. Racing has been in my life since I was little because my Dad operated the wrecker and prepared the track. So, forever, we were always at the race track. As I got older, I went to college to be an auto mechanic, and I started building engines. I started building race engines in 1975, and I was working as a schoolteacher. I had become an auto mechanics teacher. Then, I went to work for Fel-Pro, and became the high-performance gaskets manager. At that time, I really got involved in racing, and started owning race cars and building engines, and actually winning (mostly dirt track racing). Then, Federal-Mogul bought us out, and I left. They told me I had to have a marketing degree to be a marketing manager. So, we got Dyer's Rods, and we've been here ever since. So, racing's been in my blood for a long time. Both my boys raced. It's been a lot of fun. I probably have close to 300 feature wins in the motors that I built. I don't know how many track championships. But, that all goes along good with the connecting rod business because you have to know how good of rods you have to have in your engines. For me, it's the people...especially engine builders. Through my Fel-Pro history, and my Dyer's history, I've come to know and become really good friends with a lot of engine builders. There's a lot of people who have mentored me. One of those guys was Ed Stoffels, of Quarter Master. And also Scooter Brothers, of COMP Group. All these people were good to me, and answered questions that I had. And that's what the trade show does best for me: the fact that I get to see all these people. And that's probably the highlight of being in this industry, I think. It is for me anyway. It's huge. You can't buy that. You can't buy friendship and you can't buy that information. But, you have to know the right questions to ask. There is a wealth of information there, and I've been very fortunate to be part of that. It's helped me with the success of the rod business. Why I look forward to going to work every day is, first of all, I'm working with my son, Daren, and my wife Janis. I have a nephew who works here, also. Secondly, I enjoy going to work in the morning with the one goal of making the best rods in the industry. When you look at 18 years ago, when we purchased the business from Gary Dyer, and remember what rods looked like then, compared to what connecting rods look like now, the difference is unbelievable...how much better they are, how much stronger they are, and just the overall appearance. We just keep striving to win championships, and that's through having good engine customers, and taking care of them. Our latest, greatest thing is the LS market. We've got connecting rods in engines that make 2500 horsepower. It's great. That was one of the features we had at the trade show—our new LS rods. We had a really good reception for it. I should say, too, that I see a shrinking market. Whether it's been the economy or whatever, it's made us learn to diversify a little bit, and look for other areas for the rod market to move forward in. We've done off-road stuff, drag racing stuff....that LS market is in high gear, and could be good for us. It's family run. And it's in a small town of 1100 people. And I just feel like we make the best rods available in the marketplace. We don't have a computer answering the phone. We're probably one of the few companies that are that small. All of our competitors are much larger than us, but we made a lot of special rods...custom rods...and a lot of our competitors don't want anything to do with them.